...Arrive in Falticeni and follow the rest of the train's passengers up a road, cobbled and quite steep, and find my way to a big Ceaucescu style piatra, surrounded on all sides by concrete apartment blocks, and featuring the usual grotesque monuments and empty fountains in the centre. I spy what looks like the top of a synagogue from the square, standing out beyond and between the squat half built spires of another new church...I find my guess is correct. 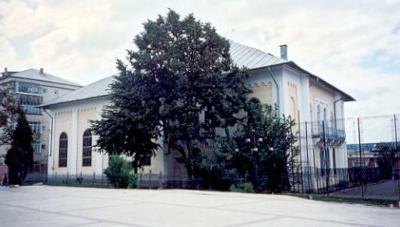 A large yellow and white schul, shuttered and locked, with a tin roof and large arched windows. It is entirely cordoned off by a high wire fence, and is bounded on one side by a primary school playground. The gate is also locked. The building seems to be in fair condition, and round the back, on the lower slope of the site, is a street with a few old terraced houses opening onto the pavement. 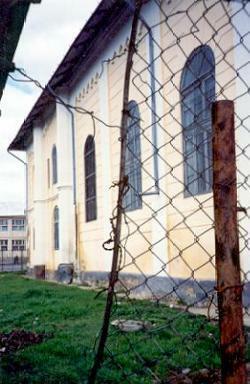 With the synagogue, the only older buildings remaining in this part of Falticeni. Before the war, about a third of the Falticeni population of 12 000 were Jewish. Now only a few dozen remain in the town and surrounding countryside. 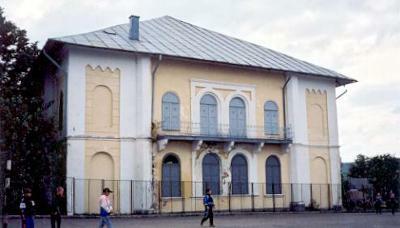 The schul was built in the 19th century, and according to my guidebook, consists of three separate prayer rooms. The description of the interior in my guidebook is tantalising, but unfortunately I don’t have any prospect of gaining entry: One could scarcely imagine the magnificence of the Great Synagogue, or main sanctuary, by looking at the rather simple exterior of the synagogue building. Under a lofty, blue-painted ceiling sprinkled with gold stars, there is a spectacular and grandiose carved, painted and gilded wooden Aron ha Kodesh that, supported by two big pillars, curves out into the sanctuary, itself surmounted by a double-headed eagle. The brilliant gold, red, blue and green dazzle the eyes, a true celebration of the Torah. There are tromp l’oeil painted curtains, shiny Stars of David, flags, banners and even the Romanian coat of arms. Around the walls are painted banners with symbols representing the Tribes of Israel, as well as painted and gilded pillars and false drapery supporting the womens’ gallery. The two other prayer rooms are small and simple. Despite a lengthy search, I’m unable to find Falticeni’s renowned 19th century Jewish cemetery. Nor am I able to find a single taxi in the town, so cannot ask to be taken to it. Apparently a number of the stones are decorated with unusually fanciful geometric and floral designs framing the Hebrew epitaphs.